Do You Want to Be Protected? The sun has been our constant source of light throughout the ages, but with the rise of technology, we have been exposed to more and more artificial light. The ubiquitous use of electronic screens in today’s digital world increases exposure to Blue Light to more than what is natural for our bodies. Adults tend to look at their devices 100 times a day, and a third of all adults spend at least 4 hours on a device daily (and this is a modest amount, often it is more). Research shows that this excessive exposure to High Energy Blue Light is a growing threat to our health. Blue Light is one of the shortest wavelengths of light (400-500nm) that can reach the back of the eye at the retina. 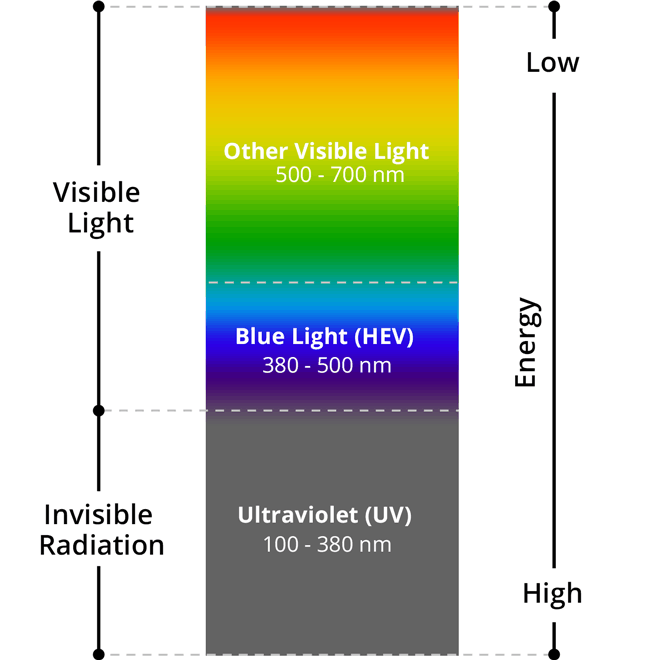 It is known as High Energy Blue Light or Harmful Blue Light, because shorter wavelengths on the light spectrum correspond to a higher energy. The sun does naturally emit Blue Light. It is even beneficial in certain quantities during the day, because it lets your body know that it is time to be awake and boosts attention, reaction times, and even your mood. However, the majority of our exposure today comes from electronic devices. Computers, phones, tablets, LED television and even light bulbs all emit Harmful Blue Light. No matter who you are, Blue Light is impacting your vision. This artificial light is causing us to be exposed to more blue light than ever before and at all times of day and night. Being exposed to blue light in high doses particularly at night, tells our bodies we need to stay alert long past what is healthy, preventing restful sleep and muddling our body’s natural cycles. What are the Dangers of Harmful Blue Light? Age-related macular degeneration (AMD) is a leading cause of vision loss in adults over the age of 50. With an aging population, the occurrence of AMD will be doubled in 30 years. Researchers have linked harmful blue light to retinal disorders, such as AMD. According to an article in 20/20 magazine, “Newer research about the effects of HEV [High Energy Visible Light], in particular the wavelengths centered around 430 nm (±20 nm) also show that…blue light plays a role in the incidence and severity of AMD (age-related macular degeneration).” This research has also suggested that high energy light damages the cells of the retina. Disrupted Sleep cycle/ circadian rhythm. According to the American Optometric Association (AOA), “Melatonin, a natural hormone that helps regulate the body’s circadian rhythm, typically elevates in the evening hours to promote sleep; however, artificial blue light mimics natural sunlight, tricking the eyes into suppressing melatonin production. This suppression is believed to correlate with wakefulness and a delayed or disrupted sleep cycle.” Researchers fear that “blue light exposure prior to sleep disrupts the body’s circadian rhythm, delaying sleep onset and affecting duration.” According to Harvard Health Publications, “Study after study has linked working the night shift and exposure to light at night to several types of cancer (breast, prostate), diabetes, heart disease, and obesity.” Furthermore, researchers are looking at the linkage between short sleep and an increased risk of depression, diabetes, and cardiovascular problems. Looking at a bright screen naturally decreases our desire to blink. However, blinking keeps our eyes lubricated. The less you blink, the dryer your eyes become, which can lead to irritation and impact your clear vision. While there is still ongoing research about the possible dangers and effects of Harmful Blue Light on our eyes and our overall health, current findings show that there is a risk if you ignore the issue. Why not protect your eyes now? For a limited time Rosin Eyecare is offering 30% off our Smart Blue Filter Glasses. Sign-up below to claim your coupon for this exclusive offer. 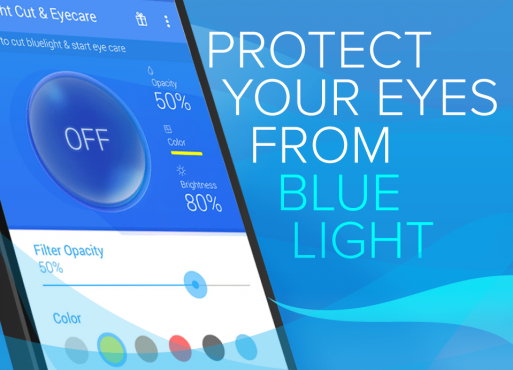 to protect yourself from Harmful Blue Light? There are a few solutions out there that limit your exposure to Harmful Blue Light. One option is using your electronic devices less frequently and almost never at night to avoid the suppression of melatonin. (This works best if you also expose yourself to natural light during the day!) If you do use light at night, use dim red lights that don’t affect your circadian rhythm as severely. Unfortunately, this solution is not always the most realistic, especially if your work requires the use of a computer, phone, or tablet. A more practical solution is Rosin’s Smart Blue Filter, a protective eye glass lens system that filters out Harmful Blue Light before it enters your eyes. Unlike other blue light protection technology, the coating is clear so that your lenses are clear, not tinted orange or pink. This lens system provides you protection to safeguard your eyes and your overall health. Rosin’s Smart Blue Filter is exclusive to Rosin Eyecare and the best technology in blue light filters. In an over 2000 wearer survey, 98.2 % noticed significant sleep improvement, 99.1% said their eyes felt more relaxed indoors, 65.1% experienced significant reduction in headaches and migraines, and 93.8% said absolute yes to wear as an everyday pair of glasses. Both doctors and patients agree that the Rosin Smart Blue Filter is the highest quality blue light filtering technology in the market, and it can help you and your family too. Call Rosin today to find out more about how you can protect your eyes from Harmful Blue Light!